Lin Wusun, a senior translator, used to be a Director of China International Publishing Group (CIPG). 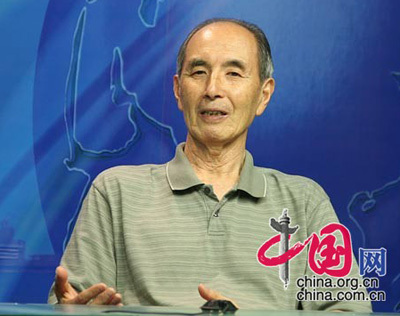 His translation works include Analects of Confucius, The Art of War, Nanjing Massacre, and Riverside Talks: A friendly Dialogue between an Atheist and a Christian. Translating is an interesting job. Good translators not only have to translate a range of works, they must also use the methods and experiences of others for reference. As a tool of cultural communication, translating promotes exchange and innovation. On July 24, Lin Wusun, a famous senior translator, visited China.org.cn and talked with us about translation and its cultural impact. China.org.cn: We know that you are rich in experience. What were the reasons that made you decide to use English as a tool of international communication and to embark on your translation career? Lin Wusun: The founding of the People's Republic of China in 1949 offered a chance for us, people studying in America, to serve our country. I returned home in July 1950 and made friends with a well-known poet who worked at People's China magazine. Previously, he and I hadn't known each other. However, when he heard of my experiences, he took my hand and said excitedly, "Our magazine urgently needs young people who can write in English. Please join us." China.org.cn: There is no doubt that translating is hard work. Some wonder if you have ever been tired of it and wanted to change a job. Lin Wusun: No. To be frank, translating is exhausting, but very rewarding, for example an in-depth understanding about the original work. Such an experience can be amazing and I feel a strong sense of achievement after recreating a work in a second language. As well as translating I write occasional articles. I think these two activities are complimentary. China.org.cn: Translating is jokingly described as "a project for the grey-haired". There are many elderly translators at the international seminars. Does this indicate that our young translators cannot tackle high-level translation works? Lin Wusun: In my opinion, no translators are ever 'past it', because their experience over the long term gives them a scientific translation method. But the case of interpreters, especially simultaneous interpreters, is totally different. Interpretation is a kind of high intensity mental work. An elderly interpreter might struggle with the pace and will eventually need to be replaced. In contrast, I would say that the experienced translator can handle urgent needs.